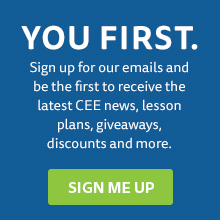 CEE lessons from selected publications have been aligned to the Common Core State Standards. The alignment connects CEE content to CCSS. The following publications were selected and aligned. Select this link and find a listing of CCSS English Language Arts (ELA) Standards. The standards are organized so that you can select a standard and see the lessons aligned to the standard. NOTE: If the standards is grayed out that indicates that at this time that ELA standard has not been aligned to CEE content. Select this link and find a listing of Mathematics (Math) Standards. NOTE: If the standards is grayed out that indicates that at this time that Math standard has not been aligned to CEE content.